The Professors were having yet another social get-together, the likes of which can range from tedious to interesting to (admittedly, with a little help) downright bizarre, and one simply attends just to see which it will be. Against their better judgment, the Professors asked Sister Madly if they could borrow a decanter- or something that could pass as such- and oh, could she pick up about half a dozen brown eggs on her way over? Sister Madly is nothing if not obliging, and went about her tasks with an uncommon cheer. When she arrived at the Professor’s house later that afternoon with decanter in hand, her cheer was bordering upon sinister. Actually, Professor, it’s an Erlenmeyer flask, in which Sister Madly usually keeps flowers. You brought us your vase?! No. She brought you a decanter. Only when it is holding flowers is it a vase. * That should be fairly obvious. * The flowers that were in the vase were transferred to the teapot. 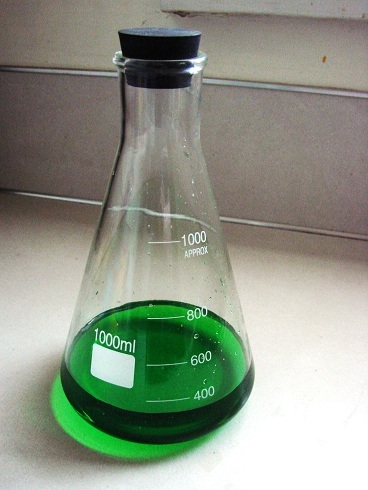 And she did rinse out the beaker beforehand, so all the fuss was quite unnecessary. But that was nothing compared to the moment she handed over the eggs. You can’t make Scotch Eggs with Cadbury! How do you know, Professor? Have you ever tried? Do you really expect us to believe that you didn’t understand what we meant? Why, she hadn’t even thought of that! This sort of stunt has become so unapologetically routine that Sister Madly merely assumed that the Professors knew she was just being a little horror. Not that she isn’t proud of the fact. What happened to them, Professor? Naturally this question had less to do with what had become of these ‘druthers’ as it did with wanting to hear the Professor try to explain definition of the word. And oh, it was completely horrible for the Professor, but it amused Sister Madly to no end. She didn‘t get very far in her conjecture before she was sent outside with a cider and a muffin. Sister Madly didn’t want a muffin. The thing had so many poppy seeds that, if one were to plant it, a row of fully stocked opium dens would bloom in its place. So she impaled it on the nearest car antenna. Now the Professors are usually reluctant to let Sister Madly out of their sight for long, in case she should sneak into a closet until nightfall and poison them in their sleep (like she would bother waiting until they were asleep.) The last time they were this negligent, Sister Madly decked the halls with so much mistletoe that one was never more than a few steps away from at kiss. This time their negligence would result in something far less whimsical. You see, Sister Madly had come across a truly horrifying recipe she had intended to make for her brother-in-law that weekend, and had picked up the ingredients along with the eggs. But why waste a ghastly recipe on someone who will only smile politely at the result before ordering a pizza when she can make it now and send the Professors into months of intensive therapy? The making of this concoction was terribly easy- so easy, in fact, that Sister Madly was almost ashamed. The Professors hardly gave her a second glance when she took her place in the corner of the kitchen, peeling bananas and wrapping them in ham. No doubt they thought this behavior was typical of one who had recently consumed a truckload of poppy seeds, and congratulated themselves for having Sister Madly properly sedated. When she asked the Professors if they had any Dijon, she was handed a bottle of Wasabai mustard, and when she asked for cream, she given a container of caramel-flavored coffee creamer. Sister Madly, being nothing if not obliging, didn’t say a word; after all, she could blame the poppy seeds, but the Professors- they could blame no one but themselves. It wasn’t long before the wallpaper began to peel beneath the cloud of the most hateful funk. That would be your druthers, Professor: Prosciutto and Musa Fruit Hollandaise- or, in bologna and cheese speak, Ham and Banana Hollandaise Sauce-From-A-Packet. This entry was posted on February 25, 2016 by Sister Madly. It was filed under Food and was tagged with blogging, culture, dark, horror, humor, Life, madness, prose, random, recipes, weird, writing. Fairly certain that recipe should be illegal. Also. Was expecting a Primus theme song…at least you didn’t mention the chimpanzee. I believe local government agencies are working on banning the recipe as we speak. The air quality has not been the same since the party. Ha! Now that is truly revolting. I suppose I shouldn’t criticize, I have eaten peanut butter and onion sandwiches, but if I had my druthers I would avoid the bananas smothered in hollandaise. The presentation however, is fabulous. It’s a very pretty dish. I’m not sure why people are always losing their druthers? I manage to find my rather quickly when it comes to things like liverwurst or spaghetti made with canned tuna. PB and onion? I don’t think I would have ever considered that combo- especially since I would have to cut the onion, and I’d feel silly weeping over a sandwich. And… spaghetti with canned tuna? I think I’d be losing more than my druthers over a dish like that! when i was in middull skool we’d have pickles-&-ice-cream. But what flavor of ice cream? we were in middull skool! ANY flavour ! Ah yes- the age when children are growing, thus do not care (well, much) about what it is they are eating. PS I really think all these little wanderings and adventures could be put into book form… I would certainly read it…sign me up…. Take my money please…! Oh, you need not worry- I do not poison my neighbors. I have associates for that! 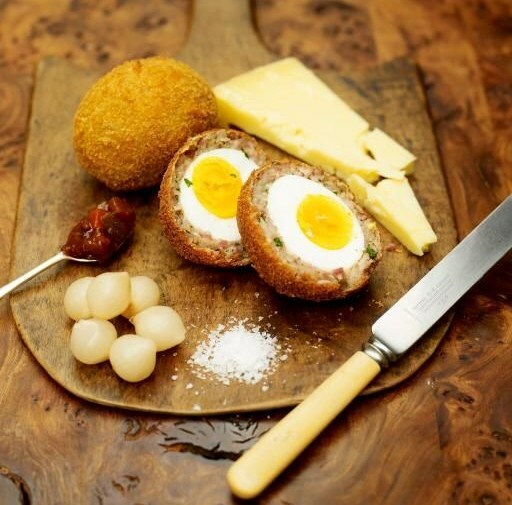 Scotch eggs! Nom, nom, nom! 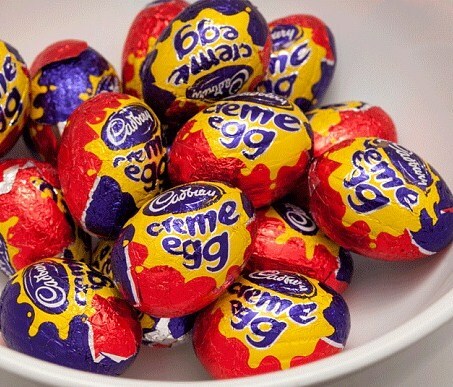 And I had no idea you could get Cadbury’s Creme Eggs in the US, that was a nice surprise! Oh yes, Cadbury eggs always show up in the month around Easter. Then they vanish until next year, leaving a disturbing void. I think that recipe induced a psychosis far beyond the reaches of therapy and Scotch eggs. There will be nightmares for years to come. Almost afraid to ask… how do you eat yours? Decapitation of the tip, then gulp the rest up whole. See, that wasn’t so bad. 🙂 Your turn. For one horrifying moment there, I wasn’t sure- horrifying because that meant that the next time I encountered a CB egg, I wouldn’t know how to eat it, so I wouldn’t eat it, and my life would forever be filled with emptiness. But upon thinking it over, I believe I eat them the same way! More than 2 bites just gets messy. Worry not! Everyone has their own way, apparently. I have been known to eat them whole (don’t do it, it makes you feel oily if you do more than three). <—– knows about druthers and scotch eggs and a Plowman's Lunch and a Plowman's demeanor with lack of dessert and an equally impractical lack of Drambuie. I'm reasonably certain Sister Madly wouldn't even wait for nightfall. Have you noticed it's a small step from SCOtch to SCOpe? I'm kind of bogged on how each is made. Maybe being green it was an Irish plot to make a better whisky that went poorly? Maybe that attempt was what the Professors wanted to recant? 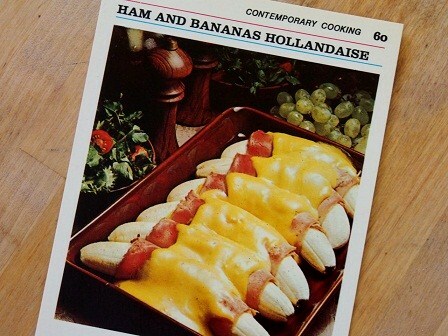 HAM AND BANANA HOLLANDAISE! People got a nerve dissin' Haggis! You’re a druthers expert? Do tell. One thing can be said about Haggis- I don’t believe it becomes radioactive after 10 minutes in the oven. Wait? Okie then. I’ll just sit with a worm on my tongue but if I had my druthers. A worm on your tongue… that tends to happen when one eats Haggis. Well now I feel doubly silly, druthers didn’t go where they should have and the bait only caught Haggis. Wouldn’t you know it, I got the small leg. Is that the leg with bells on it? Yesm it is. Dinner music of the Angels. Weirdly, this is very similar to a recipe I ate quite regularly as a child, and loved! My Grandparents lived for a time in what was the Belgian Congo (possibly the worst example of european collinisation ever) now the DRC, and I’m fairly sure my mother’s recipe came from this time. 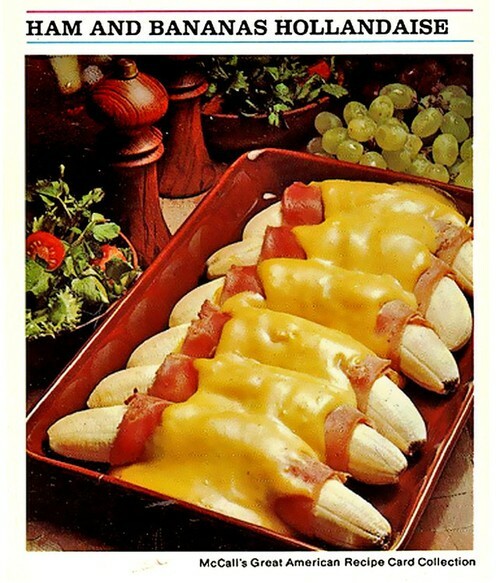 Rather than hollandaise, the ham wrapped bananas were smothered in a bechemal sauce flavoured with a little mustard and mild curry powder and topped with cheese. I have only tried to replicate it once…it didn’t go down well. I guess it’s one of those things you have to grow up with to appreciate! I believe that a curried bechemal sauce- and cheese!- would be a great improvement over hollandaise sauce mix from a packet (a powdered mix, essentially, add water and a bit of cream.) Also, they most likely used real ham, other than a package of processed lunch meat. I don’t think I’ve ever been terrified by a recipe before. There’s a first time for everything. I do hope that you do not have any nightmares tonight as a result. But there is a bright side- you didn’t actually eat it!